Pet vacations that involve a swimming pool, boating or being by the ocean with your poodle should involve safety measures so your pet is safe on a boat or in the water. If you're vacationing at the beach or at a hotel with an outdoor pool with your dog, you'll need to heed some safety advice with her just like you would with a child. Some poodles, like to swim, others don't. Some are better at it than others. Never throw your pet in a pool and expect him to swim. He probably will, but what if he doesn't? If you have a pool at home, you can introduce your dog to the water gradually. If he's a pup or older dog, take him in with you and hold him while gently gliding him around the pool. Take your hands away and see if he swims on his own. If not, grab him! If so, let him swim a few minutes then take him out of the pool. Do this every day for a week or two. Puppies will have to be taken in and out of the pool. An older dog can be taught to use steps at the shallow end. On a vacation with your pet at the ocean, keep him out of the water if the waves are high. Toys and minis can be roughed up by the crashing waves on their bodies. Standards can, too. Be sure to watch out for undercurrents which can carry your precious poodle out to sea. 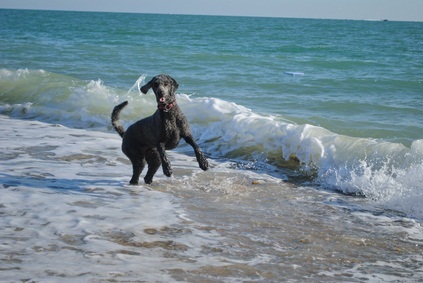 Dog vacations should be fun, but use common sense if your dog is by the ocean. Salt water can be very hazardous to your poodle's health - don't let him drink it. 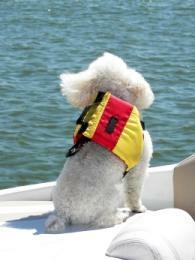 If your pet goes boating with you, put a life jacket on her just as you put one on yourself. If he goes overboard, the life jacket can help keep him afloat. 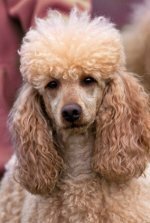 Poodles love water as they were once retrieving dogs. With some safety precautions, both you and your poodle can enjoy the water and have a nice vacation together.